Updated 2015-12-16: Continue to the bottom of the article for the results of the flag referendum! For decades, New Zealand has debated whether to change its flag, and now the country is finally putting the matter to a vote. A controversial initiative of Prime Minister John Key, the referendum officially began today, November 20. Over the coming three weeks, New Zealanders will choose their favorite from five contending flag designs. A final vote on whether to adopt the winner or stay with the old flag will happen next March. New Zealand's current flag has been in place since 1902, nearly fifty years before the country became fully independent from the UK. Its top left corner is occupied by the so-called "Union Jack", which is still the flag of the UK today. In New Zealand, one of the most popular reasons to change the country's flag is the same issue children all over the world have already noticed: It's confusingly similar to the flag of Australia, especially since the two countries are right next to each other and share close historical ties. Supporters of a change also argue that the current flag represents New Zealand's former place as part of the British Empire, and that the country should follow Canada's example by choosing a new flag for the post-independence era. And finally, many feel the flag's European-style design excludes the indigenous Maori people, whose importance as New Zealand's original inhabitants is increasingly being recognized in the country's society and governance. However, there are also many who oppose changing the flag. Among the top reasons are complaints that having a referendum and changing out the country's flags is a waste of money that could be better spent elsewhere. The referendum process is expected to cost nearly $26 million New Zealand Dollars ($17 million USD), and if it passes, many physical flags will need to be replaced, from those flying on flagpoles, to military uniforms, to sports and tourism souvenirs. Others feel that the flag's century of history is more important than its design, with some arguing that switching out the flag would actually be disrespectful to the many soldiers who have died while serving under it. The government notes that the flag has already been changed twice in the past, prior to the current flag being officially adopted in 1902. Although the parliament could have changed the flag on its own, the Key administration chose instead to involve the people more directly in the decision by holding a public consultation and referendum. The first part of the process included asking the public for their suggestions of flag designs. The government received over 10,000 proposals, including many wacky or humorous flags, such as a drawing of a kiwi bird shooting laser beams from its eyes. A government-convened "Flag Consideration Panel" narrowed down the proposals to a list of 40 candidates, then to a shortlist of just four that would appear on the ballot. The first option on the ballots now being sent to voters is this black and white fern design. The silver fern, or ponga, is a native plant living only in New Zealand, and often used a symbol of the country. It appears on the national coat of arms, famously represents many New Zealand sporting associations such as the "All Blacks" national rugby team, and even as an official symbol of the country's military at some points in history. The design with alternating black and white is based on an official branding logo adopted by the New Zealand government. The second option on the ballot combines the silver fern with a symbol from New Zealand's existing flag: the stars of the Southern Cross, a constellation which is mostly visible from locations in the Southern Hemisphere and helped New Zealand's earliest settlers navigate the ocean. According to the designer, "The red represents our heritage and sacrifices made" and "blue represents our clear atmosphere and the Pacific Ocean, over which all New Zealanders, or their ancestors, crossed to get here". This design has also won informal design competitions in the past. The koru is actually a variation on the silver fern, showing the spiral shape of a new fern frond as it uncurls. According to the designer, the koru represents "new life, growth, strength and peace" in indigenous Maori culture, and also could be interpreted as "a wave, a cloud, and a ram's horn". Twitter users, on the other hand, have humorously named this design the "hypnoflag" for its hypnotic spiral pattern. Submitted by the same designer as Option B, this flag's main difference is using black on the left rather than red. Black is a widely-used official national color of New Zealand. Prime Minister Key favors the silver fern designs, but many have criticized the two Kyle Lockwood designs for looking too much like corporate logos, or like a combination of the logos of New Zealand's two biggest political parties. This flag candidate, added late to the list due to popular demand, intentionally leaves out the traditional symbols of New Zealand in favor of something simpler. It attempts to combine Maori and British-European symbolism by being reminiscent of both Maori traditional artwork and elements of the current New Zealand flag, such as the colors and the points of the stars. Its colors represent night (black), dawn (blue), and earth (red), with the shape evoking the mountainous terrain of New Zealand and the white point symbolizing the "the collision of two tectonic plates" which formed the islands of New Zealand in prehistoric times. During the three-week voting period of the first referendum, citizens of New Zealand will rank the five designs in order of their preference, and the winner will go up against the current flag in a second three-week referendum, to be held from March 3 to 24, 2016. In that vote, New Zealanders will have the option to either make the new design their national flag, or keep the old one. If the people vote to keep the old flag, then nothing will change. But if they vote for the new proposed flag, it will replace the old one as the country's official flag starting from six months after the referendum results come in. New Zealand will then begin the process of gradually switching out physical flags and replacing them with flags of the new design. The old flag will remain a recognized alternative because of its status as a "flag of historical significance". Silver Fern (Black, White and Blue) will now face off against the current New Zealand flag in the second-stage referendum this coming March. Stay tuned to PolGeoNow for ongoing coverage! 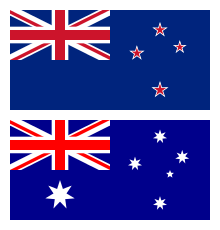 Current flags of New Zealand (source) and Australia (source) are in the public domain.